Patented food-grade polyethylene waterproofing derived from non-GMO plants. This product is covered by U.S. Patent No. 9,259,096 (other patents pending). Allergy-friendly design made without harmful chemicals: no latex, soy, GMOs, vinyl/PVC, phthalates, formaldehyde, flame retardants, or perfluorinated compounds (PFCs). Made without polyurethane foam. Contains organic cotton fabric and fill and non-GMO PLA batting. Meets all federal flammability requirements without the need for chemical flame barriers or other flame retardant chemicals. Made in the USA with domestic components and imported fabric and components; lifetime limited warranty. Mattress certified to the organic and non-toxic Global Organic Textile Standard (GOTS). Meets or exceeds GREENGUARD Gold emissions standard and UL/GREENGUARD Formaldehyde Free Standard. 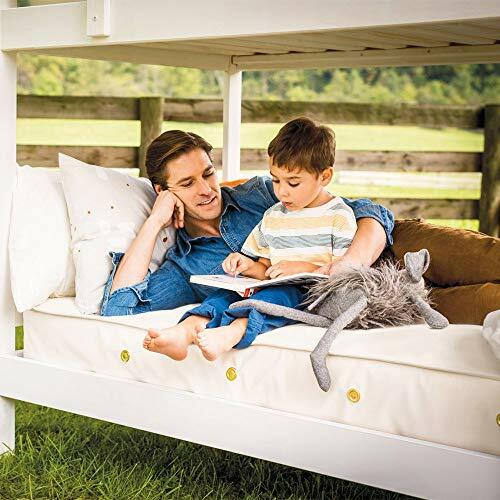 Offers a plush mattress feel that will last your child for many years. Heavy-duty orthopedic innerspring provides ideal support for children (twin 360 coils, full 528 coils). 6 gauge border wire adds strong side and edge support. The 2 in 1 Organic Cotton Ultra is perfect for growing children, combining waterproof and quilted sides for an ideal versatility for children. Use the waterproof side when they first come out of the crib and while they're training. The waterproof side also functions as a dust-mite barrier. When the child gets older, flip the mattress over for a more luxurious, comfortable feel.